ST. GEORGE – Mounting evidence shows that distracted driving poses a significant threat to public safety. Americans have a big problem on – and in – their hands. Using a mobile device while driving contributes significantly to the number of crashes involving a distracted driver, and yet it is one of the most underreported causes, which leads to underestimating the problem. So the significant threat to public safety is actually a threat of greater significance and no one really knows how fast the threat is growing. 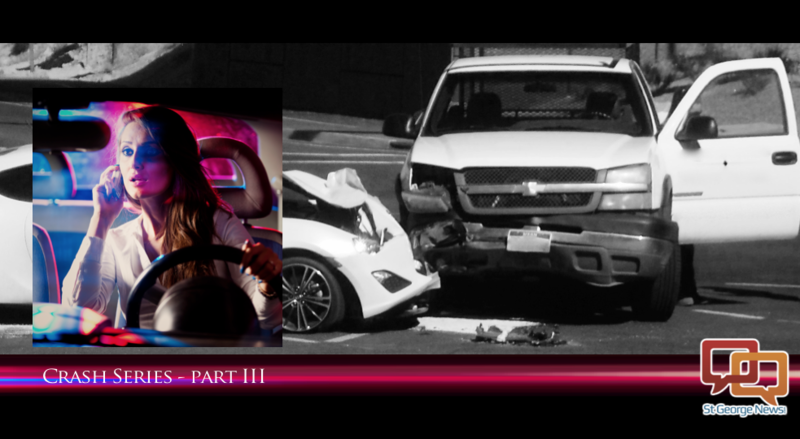 The illusion that humans are capable of multitasking behind the wheel can lead to tragic results. “We are not seeing the threat that is directly in front of us,” St. George Police Sgt. Craig Harding, traffic supervisor for the department, said, something he repeated again and again. In this Part III of the St. George News series, “St. George crashes,” we asked people to give their views on distracted driving. Click the play arrow at the top of this report to see what they had to say. Utah Department of Health hard facts: Drivers using cell phones 1) have a reaction time that is reduced by 18 percent, 2) are twice as likely to be involved in a rear-end crash, 3) are 1.5 times more likely to be involved in a crash that results in injury, and 3) are as dangerous as a driver whose blood alcohol level is twice the legal limit. In St. George, there has been a significant increase in the number of crashes over the last few years with 2016 showing the greatest increase so far. Additionally, there is a steady upswing in certain crash types or causes, Harding said. A local traffic report released at the beginning of October showed an increase of more than 150 crashes in the area over the same period in 2015. “We are seeing a steady increase in crashes caused by failing to yield, following too close, running red lights and stop signs and failing to maintain lane travel,” Harding said. “But many times distracted driving is the underlying cause in all four,” he added. Out of the four behaviors, following too close leads to more crashes than the others, Harding said. Anything that takes the driver’s attention away from the business of driving is a distraction. One study in 2009 showed that text messaging and talking on a cellphone while driving slows reaction time more than impairment from alcohol or drugs. These drivers have difficulty maintaining their lane and following distances, which makes them four times more likely to be involved in a crash. The Utah Department of Health statistics show that more than 1/3 of all fatal crashes are caused by failing to maintain proper lane travel, and more than 10 percent were caused by drivers who failed to yield. Monthly traffic reports for St. George show a 34 percent jump in the number of crashes during the month of August. Further analysis showed a direct link between certain driving behaviors, cause and crash numbers for the year. In spite of all the research, analysis and statistics it still comes down to a decision, Harding said. Car crashes take a horrible toll on families and communities in Utah: They are the leading cause of injury-related death in the state. In 2015, 275 people died on Utah roadways, and 239 have lost their lives so far this year. That number is current as of November 13, 2016. Utah distracted driving hard facts: In Utah, distracted driving caused nearly 5,700 crashes that killed 22 people and injured 3,600 more in 2014. More than 10 percent of all crashes in Utah are caused by distracted driving and more than half resulted in rear-end collisions. More than 7,000 crashes involved teen drivers, who have the highest rate of distracted driving crashes in the state. It also kills more drivers under the age of 20 than in any other age group. More distracted-driver crashes occur between the hours of 3 p.m. and 7 p.m.
U.S. distracted driving hard facts: In the United States, distracted driving kills eight people and injures another 1,100 people every day. Distracted driving comes at an enormous cost. An analysis by the National Safety Council showed that for the first six months of this year, the estimated cost of motor vehicle deaths, injuries and property damage increased 24 percent over 2014, at a cost of more than $150 billion. Additionally, the safety organization estimates that car crashes involving texting and driving account for more than 25 percent of all crashes in the U.S., but those numbers could actually be much higher. Utah classifies talking on a cellphone while behind the wheel as careless driving. This is a secondary offense, meaning you cannot be stopped only for cellphone use. All drivers, regardless of age, are prohibited from texting and emailing using any handheld wireless communication device while driving. Drivers under the age of 18 are prohibited from using a cellphone in a vehicle, both handheld and hands-free. Distracted driving laws pertaining to the use of various electronic and wireless devices while driving differ depending upon what state and in some cases what region of the state you are driving in. California prohibits all manner of texting (both reading and writing). It also prohibits cell phone use unless it is in hands-free mode. A further and detailed prohibition applies to 18-year-olds, who essentially may not use any electronic devices including a variety of messaging and computer devices. Nevada prohibits texting and handheld cell phone use. Arizona’s prohibitions vary by region. In Flagstaff, Phoenix and Tucson, texting is prohibited; in Coconino County, handheld cell phone use is prohibited. St. George crashes: Costs, insurance and otherwise, on the rise. Okay so I know I’m not the only person in St. George who’s been around the country quite a bit. But I have lived in 20-odd states and have traveled all of them. From my perspective, southern Utah is the 2nd-worst area for bad driving in the country, the Dallas-Ft. Worth area being slightly worse IMO. When I say “bad driving” I don’t necessarily mean speeding, rolling through stop signs, or pulling off the kind of lane-change moves that leave people flipping you off. I’m talking about the skill level of the drivers. In NYC, for example, one could easily make a case that there’s some bad driving going on there, especially as a tourist who isn’t used to the traffic. A little time spent driving there, however, reveals some very good driving happening in NYC – the drivers are driving very fast, making very questionable moves, but are skilled enough to pull them off consistently. So my criteria for “bad driving” is, craziness of driving habits divided by skill level of the drivers. What you have here in southern Utah is a consensus of drivers who want to drive fast and make scary moves, but who are NOT skilled enough to pull them off consistently. Without naming names even though I easily could, I know of several local residents who seem to feel they have a real mastery of the roundabouts here. They come flying into them at breakneck speed, hit the outside lane then the inside to mitigate their turning radius, and come flying out the other side just as if there was no roundabout at all. What these people apparently don’t realize is that MY driving skill is the only thing that has saved their necks on multiple occasions. What this area could use is some good old-fashioned driver education. And I don’t mean the kind of education that goes in one ear and out the other – “Buckle up, Speed kills…,” that sort of thing is just nonsense that people ignore because they’ve heard it so often it sounds like background noise. I mean public safety officials need to make an intensive effort to educate everyone in the area about the appropriate way to approach roundabouts; the hazards of using the passing lane as a cruising lane; and other specific driving skills, the lack thereof being the thing that is leading to so many accidents in this area. Some people around here don’t even seem to know the right way to pull out of a parking lot – I can’t recall a day that’s gone by when I haven’t had to slam on my brakes to avoid plowing into some seemingly worry-free citizen who was just waiting for a small hole in the traffic and has no concept of speed or braking time. I mean seriously, on some days, every other story in this newspaper is about a traffic accident. That is not an exaggeration either. we are blessed that Dump doesn’t drive. PRAISE THE LORD.